Little League has an Umpire Registry and learn more about being an umpire. 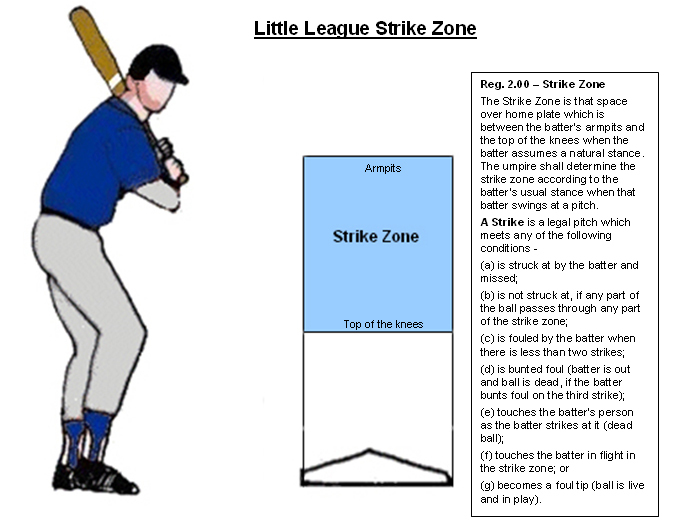 The Little League Umpire Resource web site is another good place for umpires to learn more about the art of umpiring. It provides some explanation of rules and also has the LL Rules Index. This index provides a quick lookup of where to find a certain rule. With no runners on base, the base umpire shall position himself/herself approximately 10 to 12 feet behind the 1st baseman with both feet in foul territory. The base umpire's right foot should be just off the foul line, and his/her body should be squared to home plate. Legs should be spread just over shoulder width apart. The base umpire should be in a "ready" set position with both hands on his/her knees as the pitcher is preparing to deliver the ball to the batter. 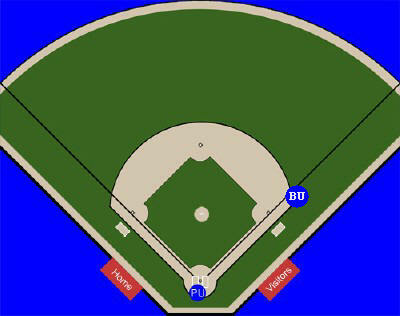 Should the 1st baseman position himself/herself deeper than normal, the base umpire will similarly back up onto the outfield grass a bit, although the 10 to 12 foot distance may be cut back somewhat so that a proper pivot is still possible on a ball hit to the outfield. Likewise, should the 1st baseman be playing in (shallow), the base umpire will also move up with the 1st baseman, never coming closer than 10 to 12 feet from the 1st base bag. The idea in each of these positions is to have the base umpire in a good position for help on the catch/no catch and fair/foul decisions involving the 1st baseman, while at the same time allowing the fielder adequate room should he/she dive for a ball in the direction of the umpire. This positioning also gives the base umpire room to "recover" and get into position for a play at 1st base should the 1st baseman dive towards the umpire while fielding the ball with a play then following at 1st base. The base umpire must be conscious about these positions so that he/she is never too close nor too far back from the 1st baseman when no one is on base. When the pitcher is in possession of the ball, the base umpire must keep his/her eyes on the pitcher for any violations of the pitching rules that the pitcher may commit. Then, when the pitcher is into his/her windup and is about ready to deliver the ball, the umpire's head should turn towards the plate, and he/she should then focus on the plate area, being ready to help the home plate umpire with any check swing possibilities, helping with the possibility of the batter being struck by a batted ball and to help the plate umpire with any balls that go out of play that the plate umpire may have trouble locating or tracking. With a runner on 1st base only, the base umpire will position himself/herself midway between the second baseman and the 2nd base bag approximately halfway (30 to 40 feet) between 1st and 2nd base and outside the infield/baseline. The umpires' body should be square to the front edge of home plate and in the "set" position (hands locked lightly on the knees). The base umpire should key this position off of the second baseman and be two to three steps to the side and behind the second baseman's left shoulder. If the second baseman is shaded to his/her left towards 1st base, the base umpire must adjust his/her position to being off the second baseman's right shoulder. It is also important to be very careful not to take a position that will be in the line of sight of the right fielder to home plate. If the right fielder asks the umpire to move, DO IT! From this position, the base umpire will be in a good position to watch the pitcher for any violations. Also, to help the plate umpire on half swings or batted balls that strike the batter; to be able to observe if the runner leaves early and if there could possibly by any obstruction on the runner stealing. It is also a very good starting position from which the base umpire can get into the proper position for any plays. With a few steps or minimal movement, he/she should be able to cover steals at 2nd base, double plays, plays at 1st base only and any possible pick offs at 1st base. It is very important that the base umpire not setup too deep into the outfield or too far towards 1st or 2nd base. That could put the base umpire in a poor position or angle that would make it difficult to properly cover and make the calls on the plays at 1st or 2nd base. In other words, the C position will be used by the base umpire in all situations that are not "no runners" or "runner on first only". With a runner on 2nd base only, 3rd base only, 1st & 2nd, 1st & 3rd, 2nd & 3rd and with bases loaded, the base umpire will position himself/herself two to three steps behind and two to three steps to the left of the shortstop when the shortstop is in his/her normal position. If the shortstop is crowding towards or playing exceptionally close to the 2nd base bag the base umpire should take a position to the right of the shortstop but no further than halfway between the 2nd and 3rd base bags (about 20 to 30 feet from the 2nd base bag). When taking this alternate position the base umpire must be able to have an unobstructed view of home plate and must be careful that he/she is not in the left fielders line of sight to home plate. The umpire's body should be squared to the front edge of home plate. The umpire should be in a good set position watching the pitcher for any violations, following the pitch to the batter and be ready to help the home plate umpire if the need arises. The umpires should make sure that they are not too deep or shaded too far towards either base when they assume this position. Being too deep or shaded too far either way could place the umpire at a poor angle or distance to be able to react and make a good, well educated call on the play. If the umpire is positioned as described in the previous paragraph, he/she will be in a good starting position for steals at 3rd base as well as other plays to the infield including runners leaving before the ball reaches the batter.